These little babies are quite the hit at our home. For starters, kale is super duper healthy. True story. Google it. 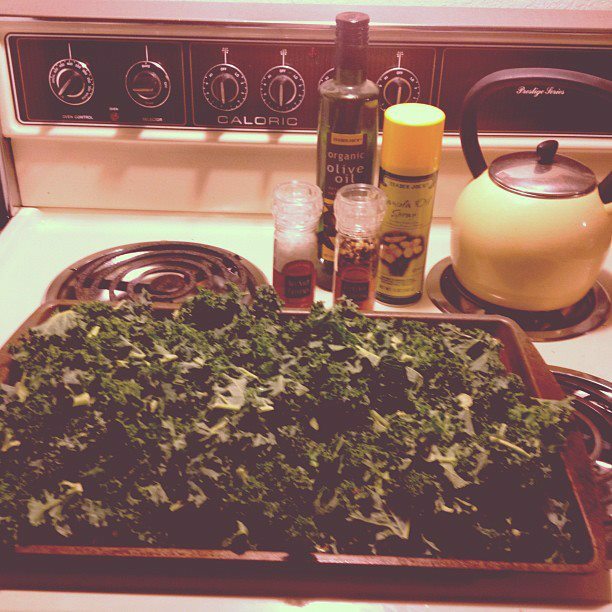 For seconds, they are cheap and require you to purchase a bag of kale to add to basic home items. For thirds, and perhaps the most important reason to Cay, we can totally nickname them "Dinosaur Chips". Now, really, how do I go wrong with that? They only con is that they make your house smell gross while cooking... but definitely not as bad as fish does, so we'll get over it. Get your little sidekick ready to bake (aka wash hands). Spray cookie sheet with your go-to no-stick spray, or put a thin layer of EVOO on it. Layer olive oil, toss evenly. Get out any of the stumpy white part. Layer on the sea salt & seasoning. Bake for 14 minutes or so.